“Here was a guy that could be described as a human dynamo, a veritable windmill with an inexhaustible supply of energy,” so wrote B-badman Pierce Lyden of his friend and cohort in screen crime, Bob Wilke. Robert Joseph Wilke was born in Cincinnati, Ohio, May 18, 1914. His father, name unknown, was born in Germany. His mother’s name and origin are not known. Wilke attended Parochial school in Cincinnati, one year of high school, Elder High in Cincinnati and the Miller Business School also in Cincinnati. Wilke left Cincinnati as a youth to work at a series of odd jobs that found him in ‘33-‘34 performing a high dive at the Chicago World’s Fair. Wilke was working as a lifeguard at a Miami, Florida, hotel where he made show business contacts which led him to Hollywood finding work as a stuntman in 1935 with his first film being the blockbuster “San Francisco” (‘36) starring Clark Gable. As to serials, most people do not realize Bob worked in 21 Republic serials, principally because he never had more than a bit role in any of them. Republic really missed the boat on Wilke, not utilizing his talents as a badman by putting him under contract and elevating him to lead heavy parts as they did with Roy Barcroft, Kenne Duncan, Bud Geary and LeRoy Mason. 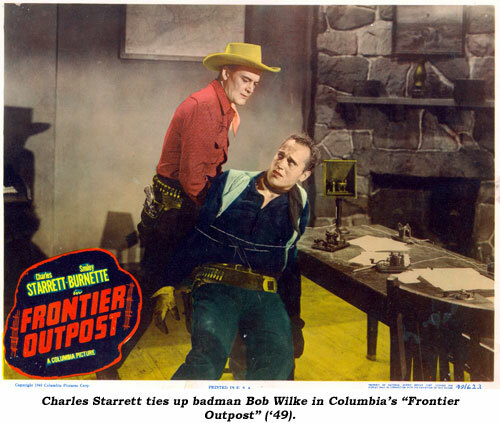 Even when Wilke began to obtain bigger roles at Columbia with Charles Starrett B’s in ‘46-‘48, Republic still cast Bob in bit roles. 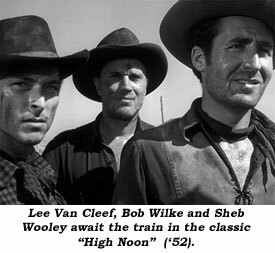 The “High Noon” role greatly elevated Wilke’s salary, and visibility at a very opportune time, just as the B-western era he’d been so associated with was coming to a close. 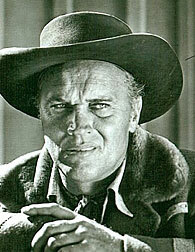 Although he did work in a few more medium budget Westerns, the weathered visage of Wilke was now considered for, and cast in, more major Westerns (“Powder River” ‘53, “Arrowhead” ‘53, “Far Country” ‘55, “Night Passage” ‘58, “Man of the West” ‘60, “Magnificent Seven” ‘63, “Cheyenne Social Club” ‘71). Good roles in important non-western films were also now being offered him—“From Here to Eternity” ‘53, “20,000 Leagues Under the Sea” ‘54, “Written On the Wind” ‘56, “Spartacus” ‘60, “Tony Rome” ‘67. 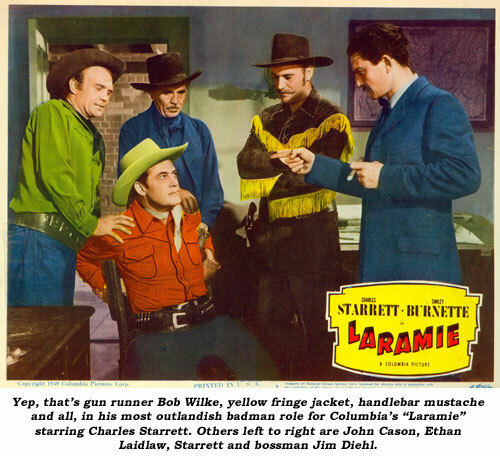 Television provided Wilke a great deal of work in the ‘50s and ‘60s, with again, “High Noon” elevating his roles from the juvenile TV westerns of Cisco, Roy, Annie and Gene to meatier roles on “Have Gun Will Travel”, “Gunsmoke”, “Lawman”, “Wanted Dead or Alive”, “Laramie”, “Bat Masterson”, “Maverick” etc. 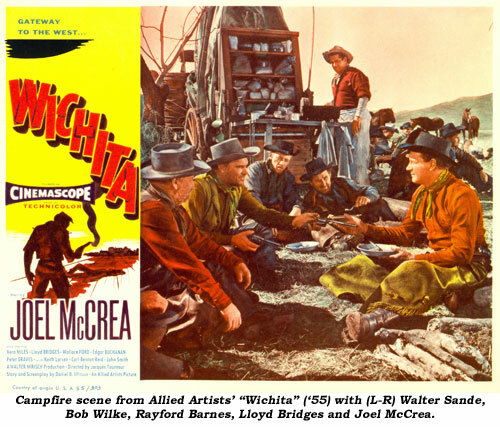 Over 140 TVers, nearly all Westerns. 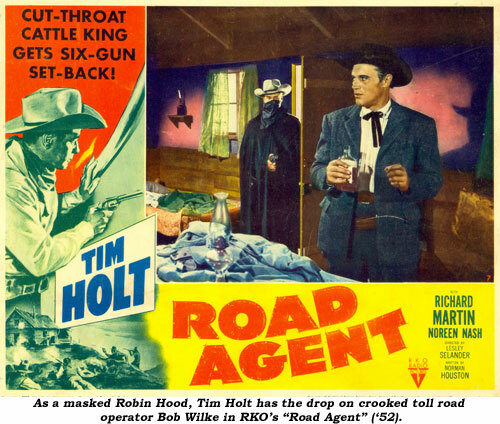 He turned to the right side of the law as Marshal Sam Corbett in his only TV series “The Legend of Jesse James” in ‘65-‘66, unfortunately the series never took off and is not well remembered today. Bob tapered off his work load drastically in the late ‘70s and early ‘80s, preferring to spend more time at his Makato Inn on Riverside Dr. spinning yarns, telling gags and doing gimmicky magic tricks. Pierce Lyden tells us Bob also owned a bar years earlier on Ventura Blvd. in Studio City. “When Bob wasn’t working, he was back of the bar. You couldn’t go in the place that he didn’t have everyone in ‘stitches,’” Lyden smiled. 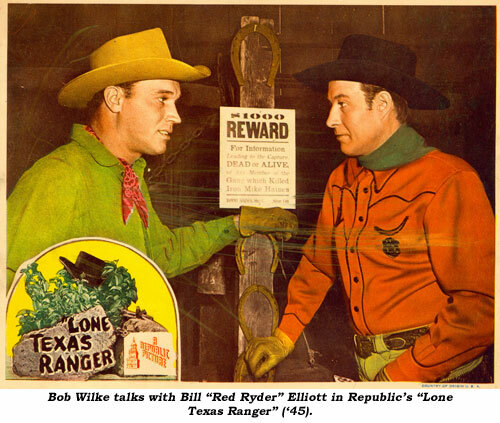 Bob’s last part was that of a train engineer in the TV movie “The Texas Rangers” with Jeff Osterhage in ‘81. Bob was married to Patricia Kesinger at the time of his death. They had one son, Bob. They lived at 12550 Ostetgo St. in North Hollywood. Without a doubt, one of the finest, most menacing Western heavies died March 28, 1989, from lung cancer at St. Joseph’s Medical Center in Burbank, California. He was 74.